Biopsy Devices Market size is set to exceed USD 3.0 billion by 2024; according to a new research report by Global Market Insights. Rising number of baby boomers prone to suffer from chronic diseases such as cancer will act as primary driver for biopsy devices market. Furthermore, sedentary lifestyle and unhealthy dietary habits with increasing consumption of alcohol and tobacco has escalated occurrence rate of cancer globally will boost industry growth over the coming years. Technological advancements in biopsy devices including vacuum assisted biopsy devices offering minimal invasiveness and favorable reimbursement policies such as Medicare reimbursement for biopsy to diagnose cancer will drive biopsy devices market. Presence of untapped opportunities in developing regions should further boost industry growth during the forecast timeframe. Rising awareness relating to cancer diagnosis coupled with growing demand for advanced diagnostic procedures should positively impact business growth. Industry players are focusing on developing cost-effective biopsy devices to gain significant share of untapped markets of developing regions such as Asia Pacific. Needle based biopsy guns product segment estimated to reach over 1.0 billion by 2024 includes core needle biopsy devices, fine needle aspiration biopsy devices, and vacuum-assisted biopsy devices. Technological advancements in needle-based biopsy guns along with growing demand of these devices for acquiring tissue samples of internal organs such as lungs should contribute towards segment growth during the forecast period. Biopsy forceps segment is anticipated to grow at 2.8% CAGR during the forecast timeframe. Rising demand for advanced diagnostic devices along with less intrusive biopsy procedures will drive segment growth. Growing popularity of biopsy forceps among patients and healthcare professionals should further support business expansion over the coming years. Ambulatory surgical centers (ASCs’) segment will witness lucrative growth of 9.0% CAGR over the forecast period. Increasing number of procedures performed at ASCs’, low cost structure compared to other healthcare facilities and less time required for procedure at ambulatory surgical center will drive segment growth. Expansion of health insurance coverage under Affordable Care Act (ACA) should further provide growth opportunities for outpatient procedures over the coming years. U.S. biopsy devices market dominated the global industry with more than 45% market share in 2017. Favorable reimbursement policies pertaining to diagnosis as well as treatment of cancer, technological advancements in biopsy devices and rising incidences of target disease will drive U.S. biopsy devices industry. 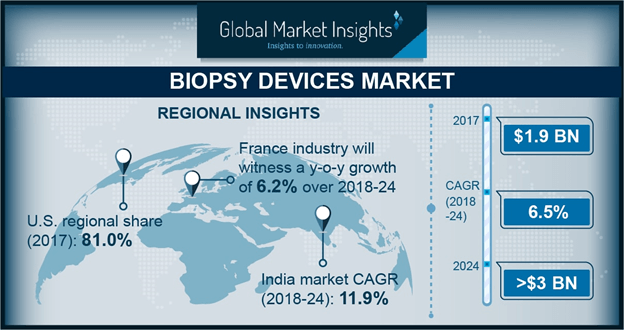 India biopsy devices market is forecasted to grow significantly with 11.9% CAGR during the forecast period owing to growing number of baby boomers suffering from chronic conditions as well as rising prevalence of cancer in the country. Numerous initiatives undertaken by industry players to develop cost-effective biopsy devices to gain significant market share of Indian biopsy devices industry should contribute to business growth over the coming years. Few notable players operating in biopsy devices market are Becton, Dickinson and Company, Medtronic, B. Braun Melsungen AG, DTR Medical, Argon Medical Devices, Olympus Corporation, and Cardinal Health. Companies are currently focusing on research and development to develop advanced biopsy devices to gain significant market share and increase consumer base especially in developing countries anticipated to witness robust growth rate during the analysis period.